Most of the time when services want to know your location, a post code and house number will suffice. For others, your longitude and latitude are necessary. From online shopping to GPS, so much depends on letting others know where you are. Knowing where you are these days is, for the most part, very simple. Most of us carry a smartphone. GPS has been part of smartphones since the days of the Nokia N95, but it’s far more accurate these days and the software has come on leaps and bounds. While Google Latitude is no longer an option, others have stepped in. Glympse is by far my favourite for sharing my location on the fly. It tracks the phone or tablet and shares your location using a one-off web address to whoever you want to share it with, and only them. It automatically terminates the web page when you reach your destination, after a preset time, or by both (whichever comes first). When it comes to sharing your location it’s great, assuming you’re on the move. When you’re not on the move and want to share a specific place, you’ll likely fall back to either an address, or longitude and latitude. I could say I’m at Tower Knowe Visitors Centre, Kielder, NE48 1BX and you could find me fairly easily. If I said I was parked at 55.1739, -2.4746 then you’d have a more accurate position, but postcodes only work if there’s a building nearby and long/lat can be easily mistaken or forgotten. What we need is a more elegant, simpler approach. Thankfully someone’s already solved that problem. Imagine if everywhere on the planet, city, homes, seas or deserts could be found using just three words. Everywhere. Three words to describe every three by three metre square. Texting someone would be far simpler. Calling 999 for emergency services, or roadside assistance (AA, RAC, Green Flag etc) could be far less stressful by giving them positions.dreaming.nipping rather than spelling out Knowe and Kielder. It’s not hard to get the location from the three words either. Prefix the three words with what3words.com/ or easier still, w3w.co/ and you have your location. w3w.co/positions.dreaming.nipping will take you to the Tower Knowe car park at Kielder Forest. With a range of map overlay options compatible with various browsers and apps for Android and iOS, it strikes me that the obvious choice for sharing your location is no longer street names or the more traditional “turn left at the Red Lion”. The app doesn’t even need an internet connection, it can provide your three word location and can even show direction and distance to a three word pin or waymarker (think geocaching). I’ve been using What3Words for a few years now, and we still add it for delivery instructions to indicate the right house, or for the front or back door. I’ve converted w3w addresses to QR codes and João Dias has added W3W’s Developer’s API to AutoTools so now a secret phrase can be sent to my phone and it will automatically reply with a link to my location. To date we’ve used W3W for everything from ‘additional instructions for the driver’ to the traditional treasure hunt for our son at Christmas and even our wedding invitations. One thing is for certain, Ozero Kovdozero, Republic of Karelia, Russia or 63.1539N, 32.1040E aren’t remotely as easy to remember as w3w.co/location.location.location. This week we’ve seen the passing of two legends; David Bowie and Alan Rickman, both aged 69, and a little earlier, Lemmy. While the world prays we don’t lose another highly acclaimed, much loved celebrity, the cold truth is the odds aren’t in our favour. So many of their era will have lost relatives in WWII. They’ll have experienced the 40’s rationing, 50’s rock and roll, the flower power 60’s, the hippy 70’s and the new romantic 80’s. Five decades of very strong influence. A combination that we’ll never see again. When it comes to talent, the experience that could be drawn upon would be immense. It’s no wonder that those who lived through those five decades and worked internationally would be so very talented. Unfortunately for those born later we live through the pain of losing such greatness. It’s a fact of life, “Man, who is born of woman, is short-lived and full of turmoil”. However painful it may be, it’s only human to think we’ll never again be exposed to the wonderful talent they shared with us. We think of the family and loved ones left behind. We are naturally saddened by their loss. But we’re also blessed by the artistry they left. We’re privileged to be able to listen to, and watch their great work. The people for whom we mourn achieved so much. Their legacies will continue to entertain us, bringing with them so much emotion. We may look at their work from a new perspective but we’ll love it as we always have. I hate to face that for more of the people we’ve admired all this time have fewer days ahead than behind them, but it is of course true. We all are here for a finite time. Not one of us is immortal. We’ll have to face more losses as time passes. For me though, I get to introduce these great works to my son. Ill share with him the great works of Robin Williams, David Bowie, Alan Rickman and everyone else who’s made such an impact on my life. We get to say we remember when this was released. We remember how we felt watching or listening to this for the first time. We share their works with a new generation, our favourite track or film. I’ll continue to play Space Oddity, Labyrinth, Dogma, Die Hard and Snow Cake. I’ll watch associated footage on Youtube. I consider myself fortunate to live in a time when these great works impacted so much on so many. Although I’ve never personally met them, they’ll always be part of me. Once again I must contact you relating to poor service from a courier charged with delivering items bought from yourself. Item 026-xxxxxxx-xxxxxxx, although delivered on the correct date, it did not arrive before 20:30. I’m sure you appreciate the importance of deliveries arriving during a reasonable time frame. All other couriers manage to deliver during office hours. With the next consecutive item, 026-xxxxxxx-xxxxxxx, the courier abandoned the items in a hanging basket by our front door. Something that is not visible until you exit the house. The latest (and consecutive) item did not arrive on the day specified. The tracking page which barely qualifies as such due to its spartan information still says “It’s out for delivery”, and is “Expected 30 Nov”. Even a plumber can give you an expected time. The person who services the gas manages to state AM/PM. I learned via twitter, and not your own help team, that the courier in question, Amazon Logistics, continues to deliver until 21:00! This sort of information should be somewhere in the tracking email. Customers should not have to learn this from a random person from social media who stumbles upon a tweet, replying in a ‘me too’ fashion. What annoys me is the fact that you have my mobile phone number which was registered with yourselves to receive tracking updates. Not one update has been received for anything purchased with Amazon. There has been no text saying a courier is delivering to us next, no call or email to say package 202-xxxxxxx-xxxxxxx would not be delivered on the specified date. Nothing. The courier you used previously confirmed receipt of a package. They then emailed early in the morning of the delivery date giving a 1 hour window in which the delivery would take place, and a link to a page showing where the van is using GPS tracking. Only once did I receive an item outside of the specified 1 hour, the item arrived 3 minutes early. I’m sure you can see the differences between the professional courier (DPD) and Amazon Logistics. Where package 202-xxxxxxx-xxxxxxx is and the time and date it will arrive here, preferably within a 2 hour window. Confirmation that future items will be delivered by a professional courier, preferably DPD. I’m sharing this across Twitter, Google+ and Facebook. I’m curious to see how people respond. Like everything, we can get a feel for something, a glimpse of understanding but nowhere near the full experience, like seeing something in a photograph as opposed to experiencing it first hand. Last night I had a nightmare, I believe this to be the seed. Watching it in bed probably didn’t help. Some dreams leave you completely unable to recall anything. Some you are still half experiencing as you wake, remembering the full event. Others unravel in great detail, each recollection unlocking another in a domino fashion, requiring a single spark to trigger your memory. I’ve just had such a spark. In reality I’m white, male, and the coins in my wallet can be counted on one hand. Some dreams I can walk again, others not. Last night was the latter. What is unusual is that I was also a member of an ethnic minority, living somewhere in the USA. The hatred felt was overwhelming. Vulgar shouts of abuse were directed at me. Anything not nailed down was thrown at me and there was absolutely nothing I could do. The crowd circled around me, preventing my wheelchair from leaving. Everything escalated quickly. Guns were drawn and pointed at me, and from nowhere plastic petrol cans appeared and I was threatened with being doused. I was completely helpless. I was terrified. Writing this now, I know it was just a dream. As vivid as it was, I know I’m safe. I’m not going to be shouted at, have things thrown at me, be shot or set alight. As scared as I was last night, I know it’s nothing more than an inkling, a glimpse at what is reality for so many. Too many. If only we could all stop the hatred. Back when I was able to hobble about with a walking stick, my son’s (primary) school banned me from using an electric bike on grounds of health and safety. I’d explained its only purpose is as a mobility aid and saying I’d planned to put a public tweet out to some lawyer friends for advice on Disability Discrimination. I’d even offered to sit on it, leaning towards my ‘good leg’, and have the electrics switched off. Only after all this was it escalated it passed the Headmistress. The council allowed it, but only if the electrics were off. A few years on, and I can’t get away with just the walking stick, I’m now in a wheelchair if I want to go anywhere, but I need someone with me because my shoulder has very regularly dislocated since I was 16 and I suffer from asthma. Both before and after getting the chair I approached the Head saying I’d be happy to talk to, and answer questions from the kids about my disabilities (right ear hears noises but not clear sound – think about being 12 foot under water and you’ll get a good idea, and my knee which I cannot bear any weight following an RTC). Every year I offer the Head the chance to raise Disability Awareness in the school. I’m still waiting. The local bus company have refuse me access when passengers refuse to fold pushchairs. Mothers and Grandmothers have said I “should budge up” in an already confined dedicated wheelchair space so they don’t have to fold a pushchair. When you face all the other passengers you’re immediately made uncomfortable, but people seem to have the right to question you about everything. I don’t mind most of the questions, it’s good that people are curious. Some questions, though are triggers for my wife and on one occasion she told the man he doesn’t have an automatic right to those answers. I read about disabled people being mugged as they’re “an easy target”, about people being trapped on planes while needing the toilet, being trapped on a train station overnight because they weren’t informed the lifts were out of order before alighting from the last train. To me, the problem is an almost complete lack of empathy and an obscene level of apathy. Councils, companies and government ministers should be made to use the services they provide in wheelchairs, while blindfolded or with ear plugs. Mystery shoppers should be employed on a regular basis to test anything and everything that’s been rolled out or updated [Something I’m more than happy to do]. We should have Disability Awareness everywhere, starting with schools. Steps are being made, progress is happening, but it’s far too slow and largely happens when someone has first hand experience of a friend or family member with a disability or an organisation has their hand forced. It shouldn’t be like this. Countries should compete for the best, and by this I mean lowest, levels of disability discrimination. Make it a contest. We need a DARPA type prize, a Nobel type prize for the best progress and/or achievements. Most of us have an Amazon account. If not for ebooks, then for general online shopping. The wish lists accommodate other web sites, for £80 a year you get free next day delivery on a large number of items, and media streaming thrown in. On the surface, shopping with Amazon appears to be a no brainer. We’re all aware that they use loopholes to avoid paying tax, that’s not what this is about. It’s other little things that on closer inspection, make you question things. Whether or not keeping an Amazon account is worth it? Recently Amazon faced criticism for stopping competitive streaming devices like the Chromecast and AppleTV. On paper Amazon’s Fire TV stick beats the Chromecast hands down, but once again, reality doesn’t quite gel with what’s on paper. The Chromecast offers much more variety. It’s also much easier to set up. What I can’t get past is that Amazon Prime doesn’t work on the Chromecast. Initially I thought it was unlike Google to be so uncharacteristically childish, not approving Amazon so they could push the Play Store. After all, Google gave us Earth, Street View and so much more. For a high profile company they’re altruistic not childish. Then logic kicked in and you realise almost everything works on it, Google make the developers kit available to everybody for free! The only reason why Amazon Prime wouldn’t work on the Chromecast is if Amazon never bothered to… ah. Could it be that they wanted Prime to only work natively with their newly released Fire TV? Surely not. Amazon recently switched their courier, from the very favourable DPD to Amazon Logistics. DPD have delivered here for a few years. Amazon Logistics, a few months. DPD email me to say they’re in possession of a package. This is in addition to Amazon’s email saying something’s been dispatched which now includes a tracking number that only works after logging in to Amazon. DPD email me saying they’re delivering that day, delivery should be expected between very precise times like 12:37 and 13:37, the driver’s name and a link to track the van the package is on using GPS. Amazon Logistics are happy with the email Amazon sent earlier to track your parcel, but after logging in you find the details are limited to ‘on the van’. If DPD cannot deliver, they photograph your front door to show they’ve actually been there, and email you while the driver walks back to the van. Amazon sends you an email saying ‘We tried but failed to deliver your package today’ without even a card through the letterbox! What annoys me is that there has been no knock on the front door. I have CCTV footage of Parcelforce passing the door and knocking on the front window because there’s been a light on [their delivery driver said he wastes far less time returning to properties after knocking on a window instead of a door – clever guy]. Amazon also has my mobile number for SMS updates about deliveries. No text message has been received. Nothing saying anything is to be delivered today, nothing from their driver saying he’s approaching or at the door, no calls, nothing. This isn’t the first time Amazon Logistics have claimed to have knocked. With such little communication, and no evidence at all to say they’ve bothered at all, it’s difficult to say whether they don’t know what they’re doing, don’t care, or the driver finished his shift before finishing his deliveries. I really hope Amazon Logistics is nothing more than a trial. If not, they need to get their act together or leave it to a company that knows what they’re doing. But to anyone who delivers anything at all, and I cannot stress this enough, don’t try to blag. Following an RTC, I’m unable to go anywhere without assistance. I need help to get out of the street. Our son gets excited following a favourable school report / parents evening because he’s always rewarded with a little something; to us it’s just a Hexbug Nano but to him it means so much more. We even take in things for neighbours because they know there’ll be someone in. If you’re going to claim you’ve been to the a house and had no reply, make sure the package isn’t valuable to its recipient, make sure you have no phone numbers, make sure the customer isn’t disabled, and above all, make sure you’re not delivering something to a hyperactive child who’s on tenterhooks about a knock at the door! Crutch went out to regain balance. Crutch hit son’s Lego Police Station at full force. 20 minutes trying to work out which piece belongs to the Police Station and which bricks are standard (non kit) Lego, where they go and if it will all fit afterwards. All this so an eight year old won’t come downstairs in the morning, see his work in pieces and have a bad day at school. In hindsight I should’ve told him the Lego criminals broke out and blew the place up. That would’ve been much cooler! Every now and then something comes along where you can see somebody’s put some serious thought in to what they’re designing. The Raspberry Pi is probably the first thing that comes to mind, the Pebble watch is another. Lego is a brilliant example. Latest to the list must be Encryptr. Like Spideroak, at its core it is built on the ZeroKnowledge principle. This got Spideroak some criticism because with ZeroKnowledge systems, only the end user (that’s you) can read what’s stored. Not GHCQ, not David Bloody Cameron, not the FBI, not even Spideroak themselves. All associated data is encrypted and can only be decrypted with a passcode, password, phrase, or similar. For a little while now (since Dropbox was hacked for the second time) I’ve been looking for something that uses Spideroak’s approach, end point decryption for keeping passwords secure. After a quick search I decided the best way was to use Spideroak’s Hive. Spideroak has a couple of options, data is stored per machine or shared with all machines signed in to that account. Hive is the latter, so my passwords are securely synced with every machine I choose to sign in with. It meant that if I didn’t have a phone signal I was a bit stuck, but only passwords for internet based systems were being stored. It also meant that I had to be at a PC to create the file but Spideroak are currently looking to implement this as an option in an upcoming release. Encryptr is the solution to the problem. It doesn’t matter if your phone gets lost, stolen, soaked or damaged because no data is stored on your phone. Every password, PIN, credit card number and note that’s stored is done so securely online. With cross platform availability, the same passwords on your phone can be synced with your Windows or Linux PC or even your Mac. It even offers a secure, randomly generated password for you when you input an entry. Best of all, it’s free. There’s no advertising, no sign up, no personal details required to use it, just a user name and a passphrase/password. That’s it. As Encryptr’s web site states, there’s a down side. If you forget your username and/or passphrase you’re locked out. No ‘forgot my password’ option as they don’t ask for your email address. Taking this into account, you have to acknowledge the advantages far outweigh any risk of forgetting your username and passphrase. Encryptr’s developers have obviously thought about what they’re doing. While basic, the app and its ethos have a solid foundation. I’d like to be able to put entries in folders, toggle the courtesy password on/off and select its length and complexity (upper/lower case, numbers, symbols etc) and be able to copy the password in to the clipboard, but these are suggestions for a later version. Considering the app is only at version 1.1.0, what Encryptr have achieved is impressive. I recently had the opportunity to answer questions about pain management and wearables. Even if you’re unfamiliar with the phrase, I suspect most people are aware of the products. Wearables are smart devices that are worn; fitness trackers, smart watches, health trackers etc. I’m not sure if those Bluetooth pills that are swallowed and feed back to a smartphone are strictly classified as wearable, but their benefits are definitely there. Real time data is big business, and there are companies all over the world looking to cash in. While many of those companies are profit based, some are more altruistic. I certainly don’t have their budget but I wonder if the limited consumer gadgets I own could be put to use? I’ve suffered with pain in my left knee after a road accident in 2007, pain in my lower back since around ’96 and my shoulder has dislocated at least since ’91. I’d love to be able to walk, but the consultant at the Pain Clinic has told me it will never happen. I’m taking it with a pinch of salt. In 1974 my parents were told I wouldn’t survive the week. I may be completely in denial, but I’d like to think that when it comes to medicine we can’t say never. Putting aside the progress that’s being made in exoskeletons, I think the odds are against me but if I can help the medical profession find a trend then I’m going to do all I can. Tasker already manages my medicines for me, announcing when they should be taken and nagging me if I’ve been unable to take them at a given time. Tasker also allows me to manually record entries to my Pain Diary. The entries update a text file (chosen for universal compatibility) via Dropbox, and also a privately shared Google calendar (accessible only via a private link). When combined with AutoPebble, medication notices can be pushed to the watch and actions taken. I can notify Tasker that I’ve taken my meds, or to dismiss the alert and remind me later. It also allows me to update my Pain Diary, all without taking my phone from my pocket. Although the Pebble smart watch is renowned for its battery life, usually lasting 6 – 8 days, I’m not relying exclusively on it. Using Tasker’s Scene functionality I can also have buttons pop up and update the Pain Diary straight from the phone’s home screen. Because of the way Tasker works, that screen and all associated settings can be taken to a tablet or an upgraded phone in a couple of minutes. Because of the way it’s set up I can add or remove items in the list very quickly. I can also type in rarer entries manually. It has only really benefited me properly a couple of times, but those times have been worth it. When a nurse asked how often I experience chest pains I was able to provide exact times and dates in a couple of minutes. Obviously, this doesn’t have anywhere near the sophistication of what is achievable or even what’s currently in development. It has to be manually selected and doesn’t include heart rate, blood pressure, etc. but that’s not what I’ve set out to do. This started as a means for me to keep a personal record of when I’m in the most pain. Providing the Pain Clinic with the entries is just an added bonus. It’s staggering to think that a mobile phone company blocked calls, texts and data because a customer’s account was overdue by £0.00, but that’s exactly what happened. * the person who uses it. Most of the time in your personal life it will be the latter. We shake our heads aghast at the person who turns their screen round so the computer can ‘see’ the printer, in the ignorant hope that the error message well go away. The person who wants to know why the printer doesn’t work when it’s ran out of toner or ink. The person with a wireless mouse who presses the buttons harder when the batteries are dying. The fact is that if you’ve used a computer, you’ve almost certainly fallen victim to this sort of thing. I know I have. Screenshot of my account. Only altered to remove account and phone number. In business though, it can be embarrassing to the company when something goes wrong. If, say, a company automated the system which blocks an overdue account then you’d expect a bit of logic, such as if the account is at least a full penny overdue then block it. 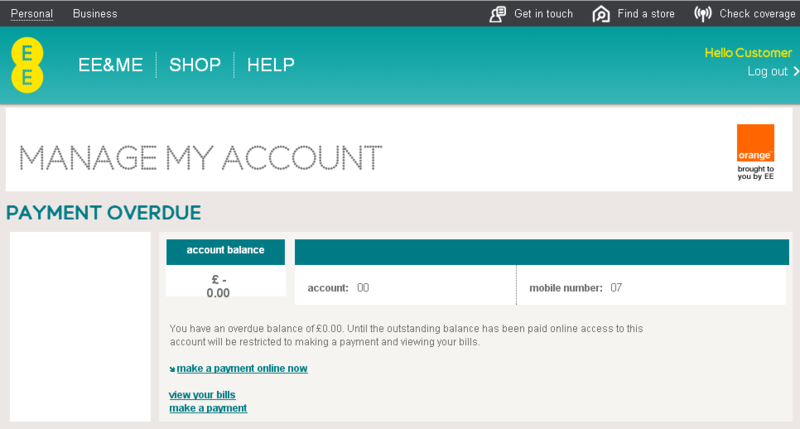 You’d not expect a block activating due to an overdue balance of £0.00. Unfortunately EE did just that. I’ve only just had it lifted after EE charged me for hidden charges they promised wouldn’t exist, but here we are again. I’m confident that it’s a value like a quarter of a penny or something like that, but it doesn’t excuse the action of blocking calls and texts. It really concerns me that this sort of thing can happen. I rely on my phone as a panic button. If something happens, I need to know I can rely on my phone to do what it’s designed to do – get in touch with people. After EE’s last let down I opted for a secondary panic button system. It’s been a bit of a wake up call. We all assume we can depend on companies providing communications services, and not just because of a disability, but because of security. Confidence that we can reach our kids, elderly family members and people we care about. In order to preserve that, companies need to know when they’ve made a mistake. If we don’t tell companies they’ve let us down then they won’t know they need to change. It looks like I need to call EE. Again.